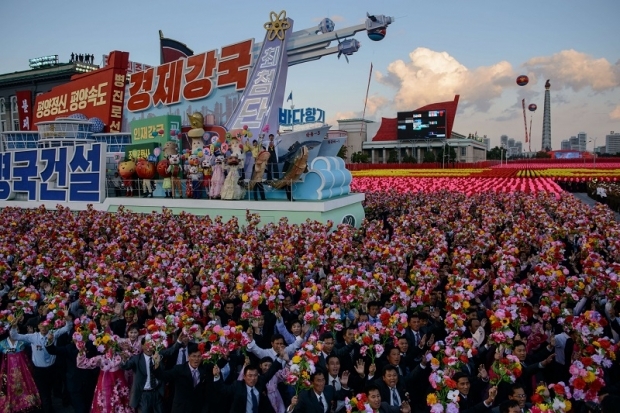 Participants wave flowers during a mass military parade in Pyongyang on October 10, 2015. North Korea was marking the 70th anniversary of its ruling Worker’s Party. On October 10, Liu Yunshan, a member of the elite Politburo Standing Committee and one of the seven most powerful men in China, paid a visit to North Korea to observe a massive parade commemorating the 70th anniversary of the founding of the Worker’s Party, which rules that country with an iron fist. On a balcony overlooking tens of thousands of goose-stepping soldiers and other displays of state might, Liu clasped hands with Kim Jong-un, who ascended to power less than four years ago following the death of his father, Kim Jong-il, who inherited power from his own father, Kim Il-sung. Liu thus became the highest-level Chinese official to visit the hermitic Communist dictatorship since Kim’s dynastic ascension. But that’s not the only sign of respect China’s government is paying to the younger Kim; it’s now censoring criticism of North Korea online, and openly calling on netizens to stop mocking the country’s leader. The years since Kim the third came to power have been particularly rocky for North Korea’s relations with China. The years since Kim the third came to power have been particularly rocky for North Korea’s relations with China. In May 2012, North Koreans kidnapped and held for ransom 29 Chinese fishermen, stoking popular anger; in February 2013, Pyongyang reportedly ignored Beijing’s entreaties not to carry out its third nuclear test. Meanwhile, to many Chinese online commenters, North Korea appears to evoke China under late communist strongman Mao Zedong; a totalitarian state, economic backwater, and international pariah that shares a Communist provenance with China but has shamed itself with its inability or unwillingness to follow their country’s reformist blueprint. Unable to speak with such force about Mao, or China’s current leadership, netizens have for years taken delight in tweaking Kim, touching up images of his visage with lipstick and rouge and creating a video showing Kim him in a muddy fistfight with the Japanese prime minister. Liu, who directed China’s propaganda apparatus for years, is surely mindful of this dynamic, and China’s state media apparatus kicked into audible gear following his visit. A widely circulated October 11 article on popular social media platform WeChat depicted Liu as having brought the “gift” of Party support for Kim and his government with him to North Korea. The article, highly sympathetic to the “extremely hard-working” Kim, complained that Chinese liberals “frequently shoot off opinions about a cooling in China-North Korea relations, or Chinese abandonment of the North.” But nothing could be further from the truth, it argued; Kim has simply been “busy with internal governance” since ascending. Chinese government mouthpiece People’s Daily then featured the visit on page one of its October 12 edition. It stated that Liu also attended that evening’s march by torch-bearing youth, lay flowers at the base of a memorial for late Worker’s Party founder Kim Il-sung, and toured the Korean Fatherland Liberation War Memorial. Contrast that fawning state-driven coverage with Chinese cyberspace, which for years has been awash with invective aimed at Kim Jong-un, whom netizens commonly called “fatty Kim the third.” A July 2014 analysis by Foreign Policy showed 15.7 million mentions of the term on Baidu, China’s largest search engine, and found plenty of grist as well on the Twitter-like Weibo, a breadth of use that constituted “proof positive of censors’ indifference.” But that all appears to have changed; an October 12 search on Baidu blocks all mentions of the term for failing to cohere with “relevant rules and regulations,” although a search for “little fatty Kim the third” calls up a dead link that promises to lead to 336,081 related images, a vestige of the term’s bygone ubiquity. On Weibo, as of October 12, searches for the term have been blocked, also “in accordance with relevant rules and regulations.” Such language typically indicates that officials have sought censorship. The drive appears to be part of a government-led effort to rehabilitate North Korea’s tattered image within China. It’s unclear what has precipitated China’s recent shift. Chinese officials may feel a corrective to the longstanding vitriol is needed, given that the party-state feels that tolerating North Korea’s erratic behavior is in China’s interest. Far better to have a relatively pliant neighbor, the rough calculus goes, than a collapse or reunification with South Korea, either of which would position the U.S. ally at China’s southern doorstep.